HTC has just confirmed that the next U handset will be squeezable, so its owner will be able to make gestures by squeezing the sides or swiping on them. This way, HTC plans to take smartphone controls beyond the limits of the display. HTC U Ultra and its companion known as U Play are not doing that great, the first price cuts being operated less than a month after their launch. Now, those interested can get the U Ultra flagship for 20 percent less than its original price. However, HTC seems to have something interesting in the pipeline - a squeezable handset. According to VentureBeat's Evan Blass, quoted by TechCrunch, the upcoming HTC U phone will not use a rubber design, but "the phone’s metal frame will include embedded sensors that enable its owner to control settings and make gestures by squeezing its sides or swiping up and down on them." HTC's teaser video does not reveal much, unfortunately. 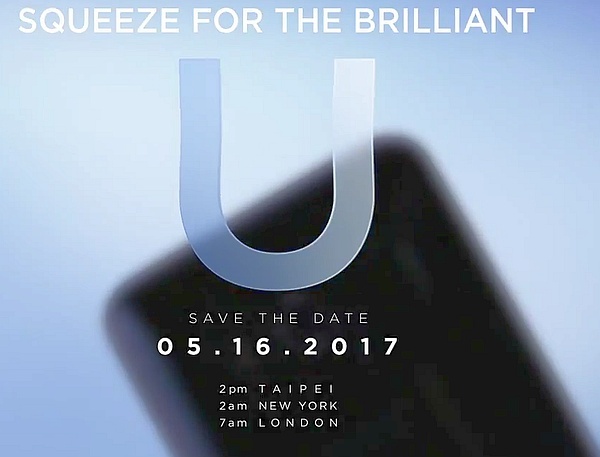 The company posted it on Twitter next to the following message: "Squeeze for the Brilliant U. 05.16.2017." These being said, we should wait for the next rumor or HTC's next teaser. In the worst case scenario, we will have to wait until May 16, so stay tuned - sooner or later, we will find out all there is to know about this handset.